Matera is one of the most ancient towns in the world. From the Neolithic era and for almost 7,000 years human life has been going on, non-stop, on this same site.The ancient town sprang out of a rocky area sitting on a great limestone gorge: the Gravina of Matera. It has developed with a close relationship to the rock. On the plateau overlooking the Gravina of Matera you will find the prehistoric villages of Murgecchia and of Murgia Timone, the latter being well known and easily accessible. 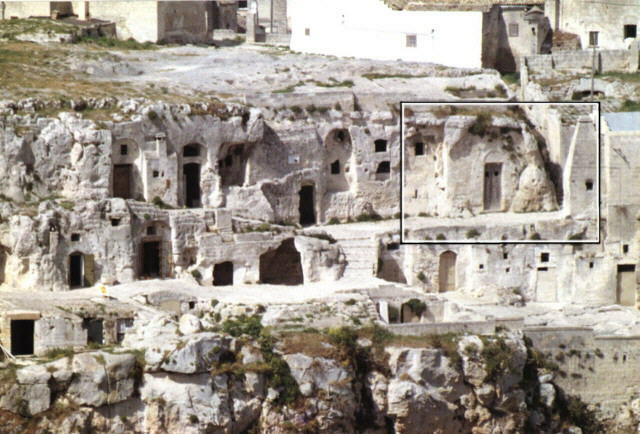 Caves were also used as dwelling places at that time.As civilization progressed, the "out of land" town was built using the "tuff "stones from Matera's "Murgia". In the 6th c. B.C. 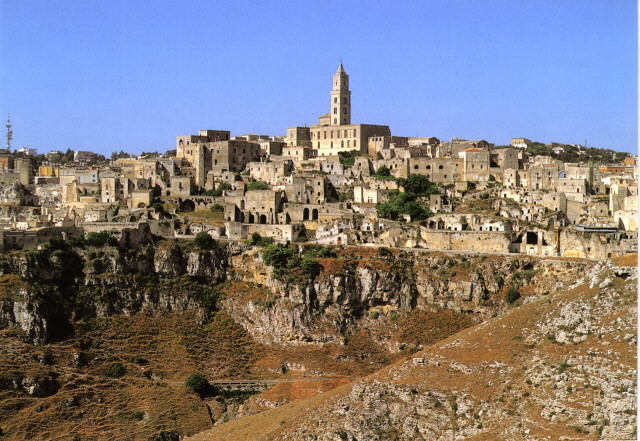 Matera was the hinterland of the big cities of Magna Graecia (Taranto, Metaponto, Crotone, etc.). The original site for the man-made town, called Civita, is at the centre of the Sassi.Today, the 13th c. cathedral stands out on its top.In the Roman period the CIVITAS was fortified with walls, underneath them there were open spaces with several caves and big rocks, that is how the two ancient districts were named Sassi. In the Roman times in these spaces "Rural Homes" were built on those areas. Over time and especially in the Middle Ages, expansion was such as to include the Civita itself. 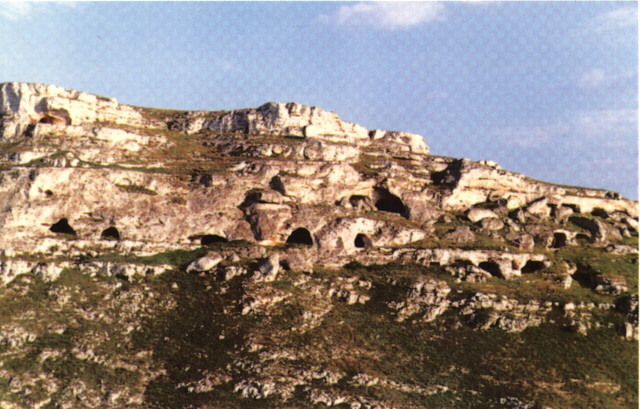 The whole two-faceted resulting area was given two names: "Sasso Caveoso" and "Sasso Barisano". Along with the man-made town, life in the cave excavated from the rock has been going on according to the historical and economic events that took place on the site.The Rupestrian caves were much exploited in the 7th c. B.C by Benedictine and Greek-Byzantine communities.The latter had brought with them from their homes (Cappadocia, Anatolia, Armenia) a kind of cave-life culture which eventually merged with local experts in excavating "tuff". Chapels, churches, Rupestrian basilicas together with monasteries excavated from rock, lauras and ascetic sites appeared at that time.As long as they could afford it, the Sassi people built their houses on the outer ground, assigning the caves a by-function of storage, cellars and stalls.Matera, originally Terra d'Otranto territory (Apulia), had been Basilicata's chief town from 1663 to 1806, when Potenza was made the region's chief town. That was the best period for the town's development. Indeed, many civil and religious buildings were spreading, among which Baroque Churches and Monasteries, now used as sites of public and cultural institutions.From the first decade in 1800 until 1952, the town experienced a long period of decay both because of recurring agricultural crises and the loss of political power. 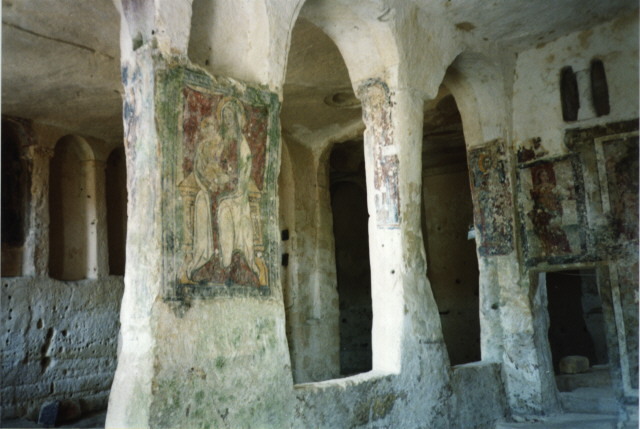 The deterioration was so serious that the poor people were compelled to use the caves as dwellings both for persons and animals. Demographic pressure and misery turned any available room into a dwelling and any Stall-Cave into a Cave-Dwelling-Stall. This miserable life style continued up until 1952. 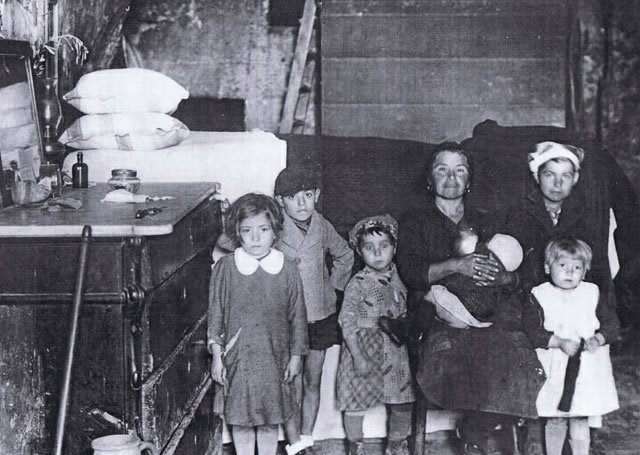 At that time, a special bill on the Sassi was first passed by Prime Minister Alcide De Gasperi and the transfer of over 15,000 people to new quarters in the modern city began. These new quarters were built according to a specific and organic plan by architect Luigi Piccinato.At that time, Matera had about 30,000 inhabitants and the transfer of half of the population occurred between 1953 and 1968. The Italian government based this massive moving out of the Sassi on the exchange of property rights. One house in the Sassi was exchanged with a newly built house in the areas further up hill. As a result, 70% of the Sassi are currently under State control.The Sassi having been included in the UNESCO World Heritage List, are now undergoing a complex restoration and renovation project so as to show to greater advantage the impressive, historic, artistic and commemorative resources found here.